Today I bring a sad card. My friend called yesterday to inform me her father passed away in the morning. This is all very sad, as I remember her father being a real colorful character, visiting us all when we were in college in that 1970's station wagon. Over the last few years, he came down with a mysterious illness that first took away his ability to walk, then developed into inflammation on the brain. And then he kept bouncing back between rehab, surgery and MRSA infections for several years in a yoyo until his mind was completely decimated. My friend was supposed to be traveling on Monday to help her mother place him in hospice. Anyway, I made this card for her today and will need to feature the card I am making for her mom, next time I post. 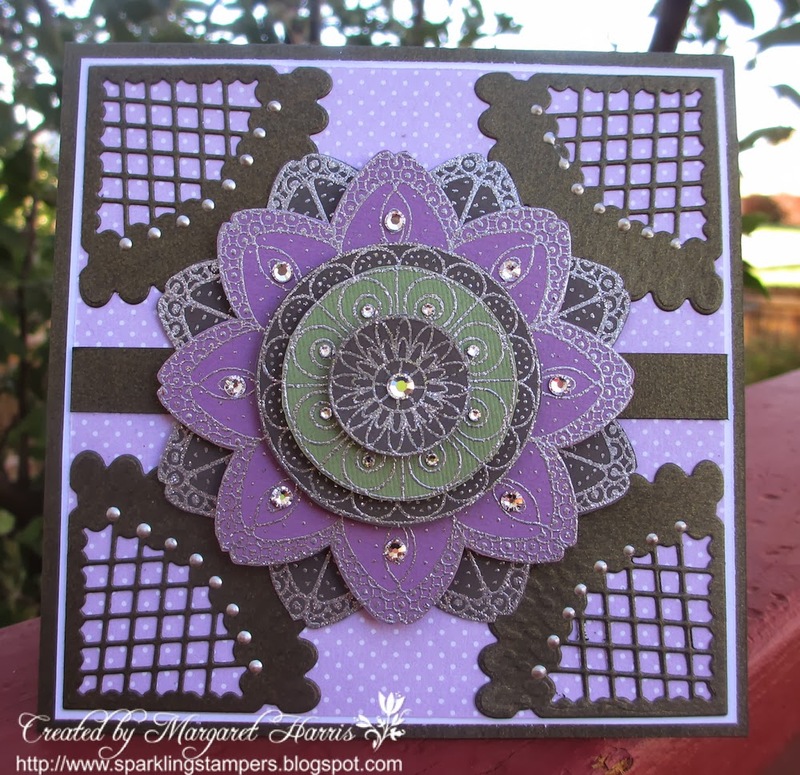 This card uses my very special stamps: Outlines Mandalas (Flower Blossoms). 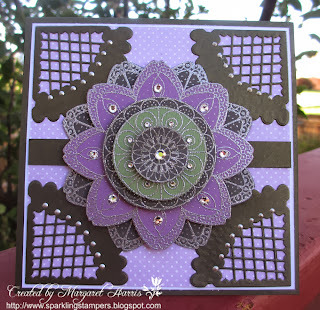 This company is no longer in business but brings back fond memories for Kathy and I because it is one of the first ways we got enmeshed into stamping...by making these gorgeous mandalas with numerous Swarovski crystals and foam tape. It takes lots of work to put these babies together. We have made all types--some that you can hang on a Christmas tree, others that I've place in shadow boxes and then of course the cards. I tried a new Memory Box Die, which you can see in the corners. It's rather large, don't you think? This is the smallest one they have I believe. I decided to try one...and now I'm not sure how much I like it. The rounded edges are supposed to be embossed. It didn't really come through even though the sandwich I made was so tight I could barely turn the handle. The paper IS very thick so maybe that is why, but it was a bit disappointing not to see the detail. Pehaps with the size, the die will work better on a scrapbook page. Anyway, that's my creation for today. I will be entering it into the 613 Avenue Create: Challenge #40, Anything Goes. Thank you for stopping by...and have a lovely week. This is a gorgeous card with which to express your sympathy. Beautiful job.